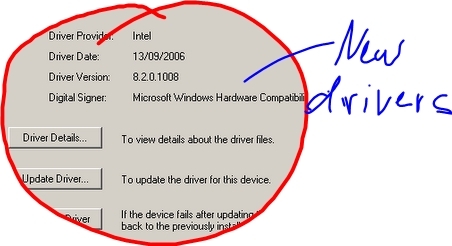 I found in this blog about New Intel Drivers that fixed often WiFi disconnections suffered by R2H owners. Well, I was having the same issue in my Q1 and after installing them the issue disappeared. For those who can't live without a keyboard Mendion MD RIM 1000 could be all they have asked for. 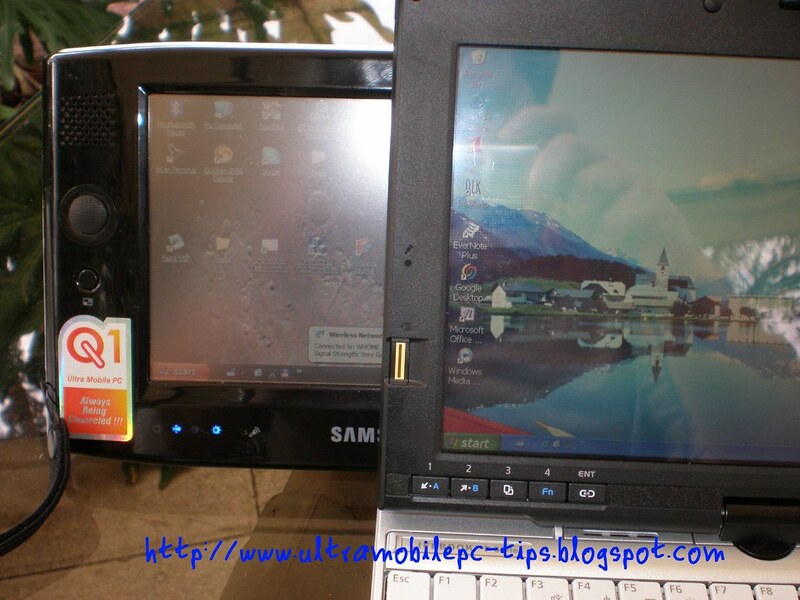 According to Gail Levy from Tabletkiosk, v7110 owner could have the eo docking station early the first quarter of 2007. Hello all,I'm hearing from our R&D team in Taiwan that the dock for the eo v7110 is undergoing testing now. In fact, I expect to see the docking cradle at CES. At this point, the release date for the docking cradle in early Q1 is entirely realistic. In fact, I am going to have our website updated to reflect this information. As I know more, I promise to keep this community updated about it! 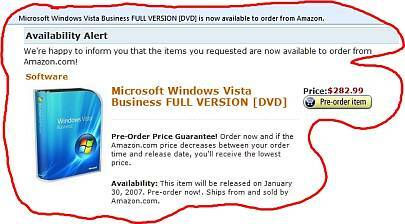 First let me say that Vistagami is just an internal code name my team came up with to name the Windows Vista version of Origami. More precisely, it is the internal code name of the next version of the Touch Pack. What is included, what it will be named and how it is different from the XP version, etc. has not been disclosed yet. Vistagami isn't intended to represent any new UMPC hardware, or improvements on things such as battery life, lower prices, etc. That's not to say these issues aren't being worked on by OEMs, it's just not part of Vistagami. Rebember that Microsoft as a provider of software to OEMs actually has little control over the actual hardware designs, specs and prices of UMPCs that actually come to market. We of course meet with OEMs often, give them feedback on their designs, recommend performance targets, hardware specifications, etc. but in the end a manufacturer has the final say on what they deliver to the market. 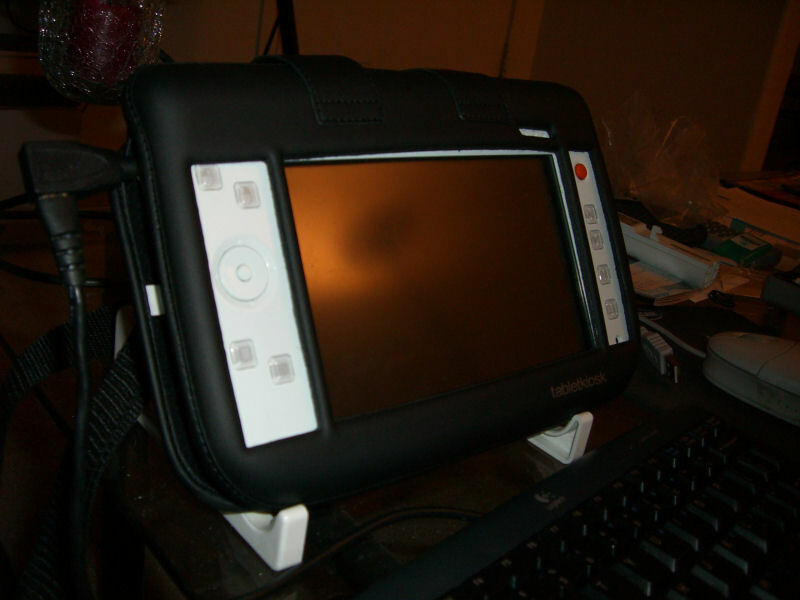 A few weeks ago I wrote about this device made by Targus and that I thought could be useful for UMPC Owners. Well, I have the change to check it for a few minutes and here is my mini review of it. 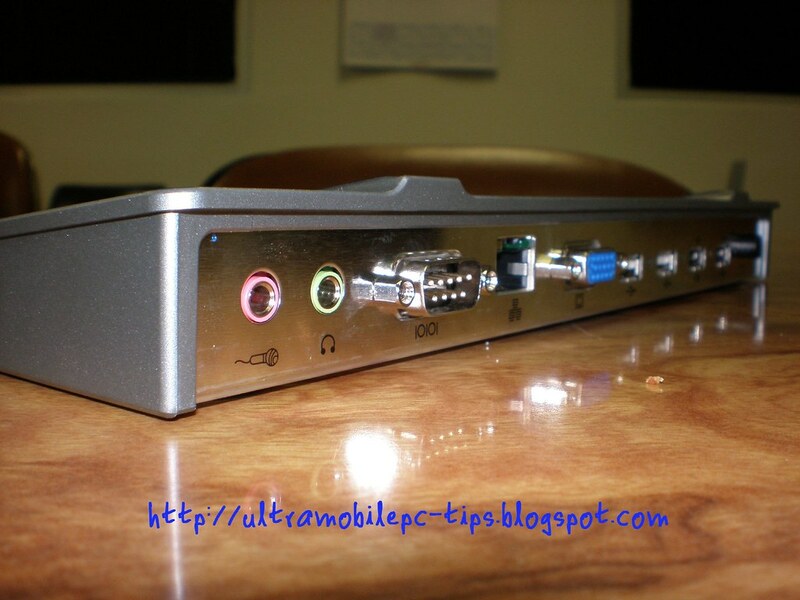 This Universal Docking Station connects to your UMPC, Tablet PC or Notebook using a USB Cable. 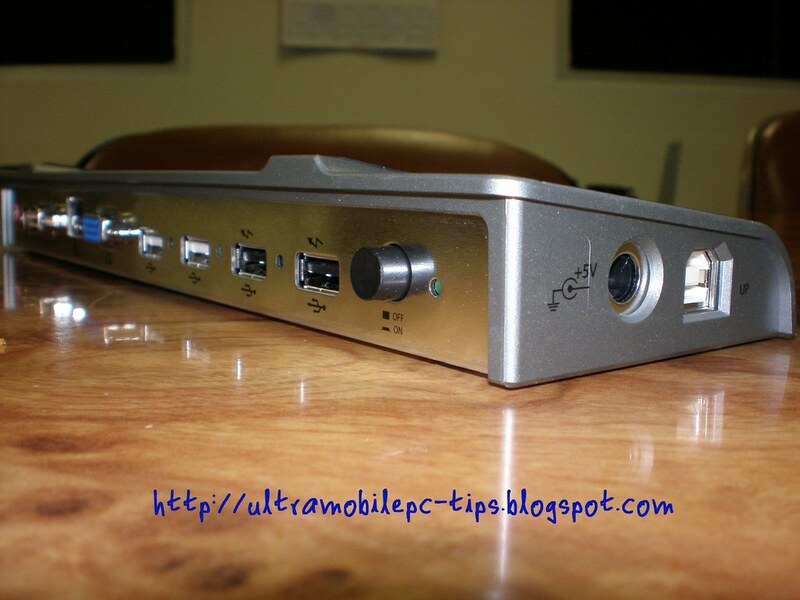 The above picture shows the left side of the docking station where can be seen the power jack and the Mini USB jack for the USB Cable that connects to your computer. You can also see clearly the Power Switch and four USB ports. 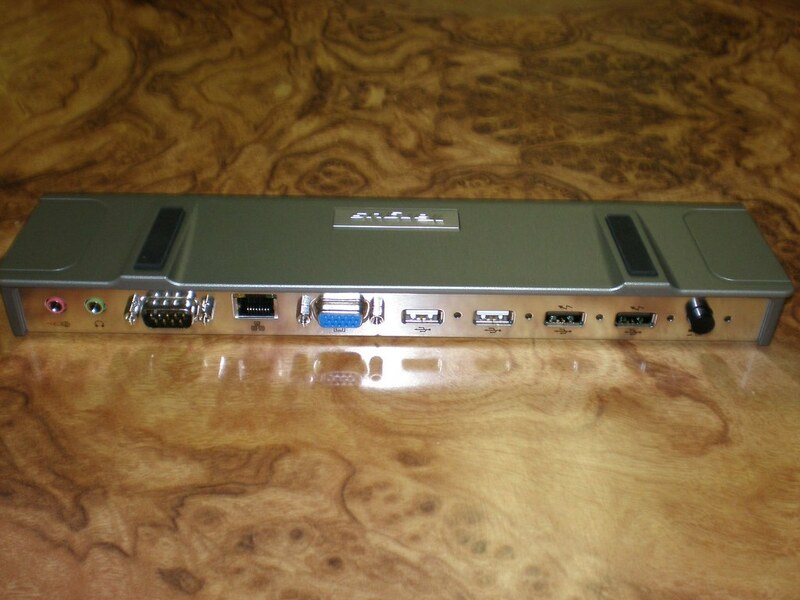 The two first USB ports from right to left are powered by the power supply of this device. This means that you can use those to charge any device even if you don't have your computer connected to the Station. The last two ports are only powered when your PC is connected to the Station. Targus Universal Docking Station provides you with 1 Serial Port, 1 Ethernet Port, 1 VGA Port, 1 Microphone Jack and 1 Stereo Sound Jack. Many of you commented to me that this Universal Docking Station was going to have one serious problem: the USB port Speed. To check this point I connected my Samsung Q1 to this Station and I run what I think is the most demanding task, I played a movie one my Samsung having it shown in a LCD Acer Monitor connected to the Docking Station. Worse than this scenario could be playing the movie while streaming it from Internet but I thought that having in my Q1 WiFi and an Ethernet Port I could use any of these connections to avoid to overload the USB traffic between the station and the Q1. 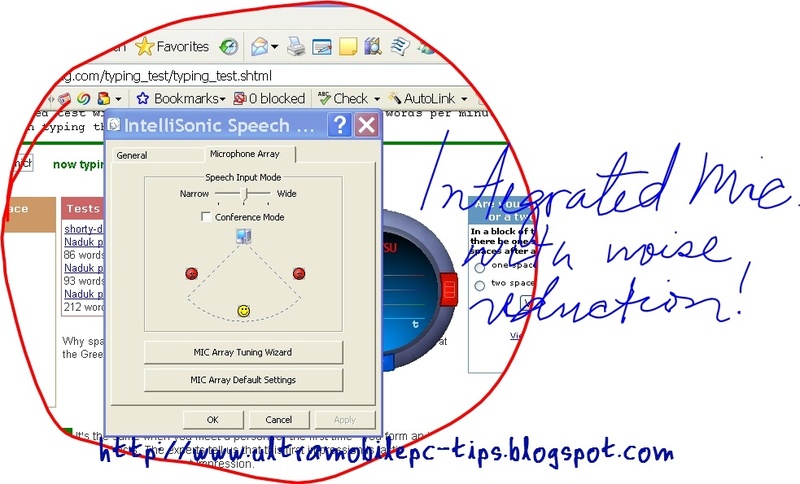 I had two multimedia speakers connected to the sound output of the Station. Said this, I can said that the movie was played skipping some frames, I would say that it was playing at around 10 to 12 frames per second. Would I watch movies in this setup? I do not think so. But, I did some office work, typing documents in Word and Excel, I did browse the Web and on these tasks the Targus Universal Docking Station worked very well. One Important point. Before you use this Station for the first time you have to install the drivers provided by Targus. And a Second Point, the graphics drivers provided by Targus do not support the 800x480 resolution so you have to switch your UMPC to 800x600. You can use the 800x480 but you get a black band on top and bottom of the image in the external monitor. Pros: It's a cheap way to have your UMPC connected in your desk to a big monitor, a normal size keyboard and a mouse. Add to that Ethernet Connectivity and two multimedia speakers and you are ready. Another good point is the 4 USB ports, 2 of them all time powered. Cons: Having the Station connected via USB limits the video quality. The station is good for presentations, document edition, etc, but forget about gaming or video. What is my rate for this device? I have two rates in this case. I give it a 7 from 10 if you can buy it for less than 40 dollars, and 5 from 10 if you have to buy it for 120 dollars. Oh yes, price is part of my rating system too, definitely I would think twice before I buy this at 120 dollars but for less than 50 dollars this docking station could be a good solution for those UMPCs that have not any docking station yet made or sold by their OEMs. You can check the rest of the pictures that I took for this review here. 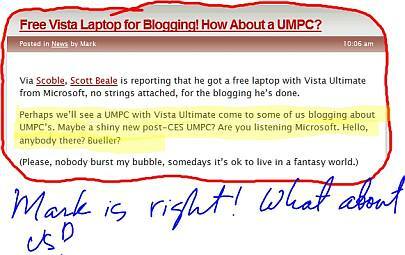 What about a Vista UMPC for Blogging? 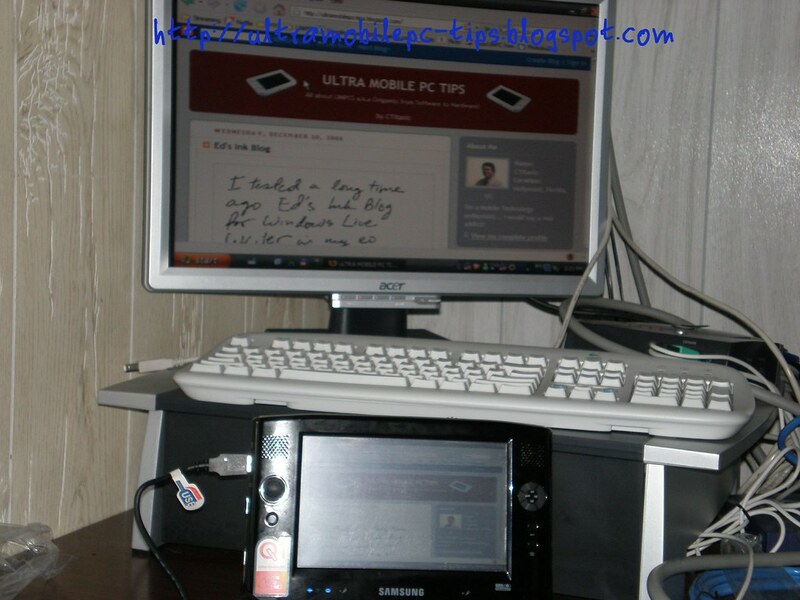 Here is another accessory that can be used in the CF slot of Samsung Q1: the Enfora GSM/GPRS Compact Flash Card. Enfora's third generation IP (GSM/GPRS) modem provides mobile communication anywhere, anytime from the widest variety of devices - now with a slightly smaller external footprint. 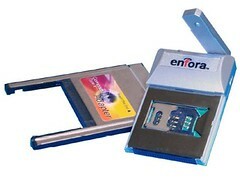 With a Type II Compact Flash form factor, the Enfora GSM/GPRS Compact Flash Card works in virtually any CF equipped PDA. 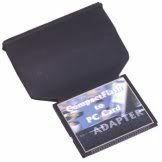 Slide it into the included PC-Card Sleeve, and use the same modem for communication from your laptop. Based on Enfora's cutting-edge Quad Band GSM/GPRS module, the Enfora GSM/GPRS Compact Flash Card enables communication on GSM networks worldwide. With the included BVRP mobile PhoneTools and pocket PhoneTools software providing connection settings for most carriers worldwide, setup and configuration is quick and easy. 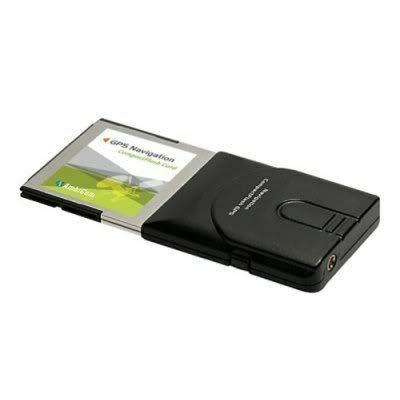 Use the Enfora GSM/GPRS Compact Flash Card to access e-mail, browse the Internet, and send and receive instant messages, or make voice calls directly from your laptop or PDA. 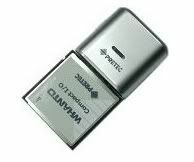 Compatible with Pocket PC2002, PPC2003, Windows Mobile 5.0, Windows 2000, XP. Keep in mind that the speed that you will get on these one is going to around the same you had in your old 56kb modem. It was announced officially Yesterday in the latest UMPC cast. A site like this is a very ambitious project so I really wish good luck to my friend Steve in this new project. what are you expecting from CES? Our French reader Jeff just send me an email to tell me that Belgium Press is reporting about Samsung's two new devices: the Q40 and a Q1 with HSDPA or High Speed Downlink Packet Access. Where is Hugo Ortega? I have not seen him posting too much at his blog, but I have read this article from an Australian Magazine. After reading this article the only thing that came to my mind was Jesus's words when he said "Forgive them, they do not know what they are doing"
I can't believe that this year is going to end with this wave of crap published everywhere. I have been reading news lately about two devices coming soon: the HTC Athena and Tatung. These devices have been called by the OEM or by the press UMPC, and I think that the reason why is because of their size. 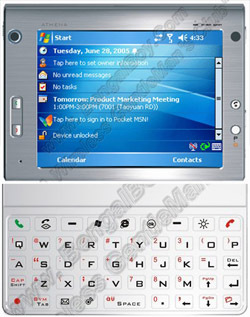 In my opinion they should have been called PPCS which means Pocket PC on Steroids. 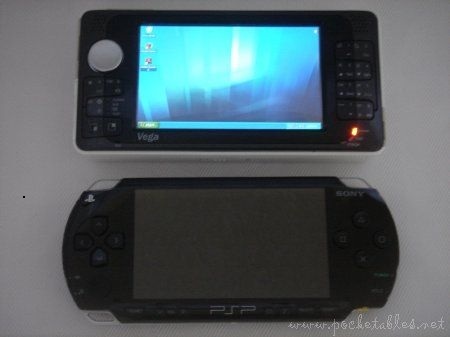 Yes, these two devices use Windows Mobile 5, based on Windows CE. This Operating System has a lot of advantages like Instant On, a very easy to use Calendar and an Easy to Use Contacts. But it has a huge to me disadvantage, it can't run the millions of programs available for Windows OS for PC. 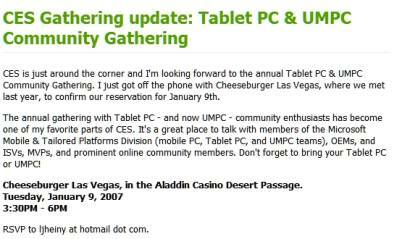 This disadvantage is what has pushed me and many others Pocket PC owners to buy a UMPC. Of course, this is another valid option for some. But... Don't let them lie to you. You are buying a PPCS not a UMPC. Be sure that you are buying what you really need. 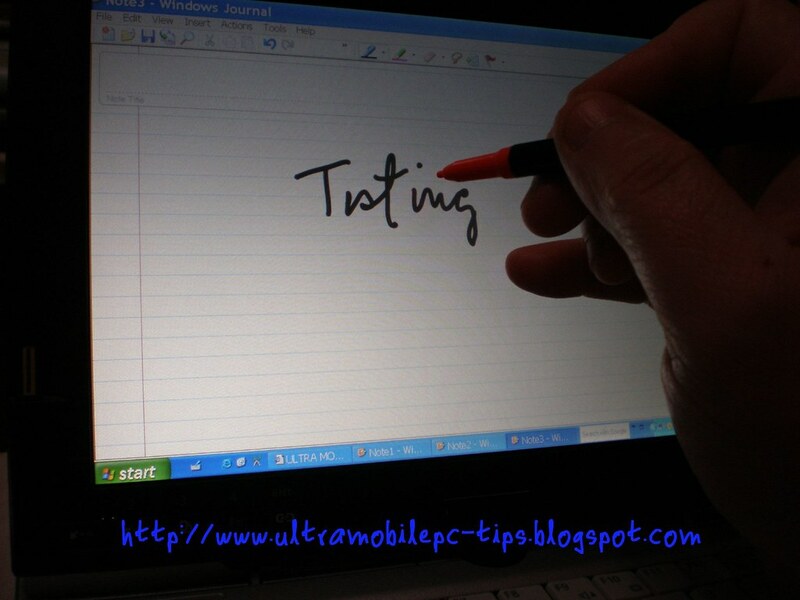 I tested a long time ago Ed's Ink blog for Windows Live Writer in my eo. Today I installed the latest version in my Q1 and it works great! There is a rumor going on in Taiwan about Asus releasing a new UMPC next January with a VIA Processor. The Asus is the cheaper UMPC sold in Europe for about 755 Euros, this means that probably we will see prices in Europe of around 650 Euros. Yeah, we will see more UMPCs next year. 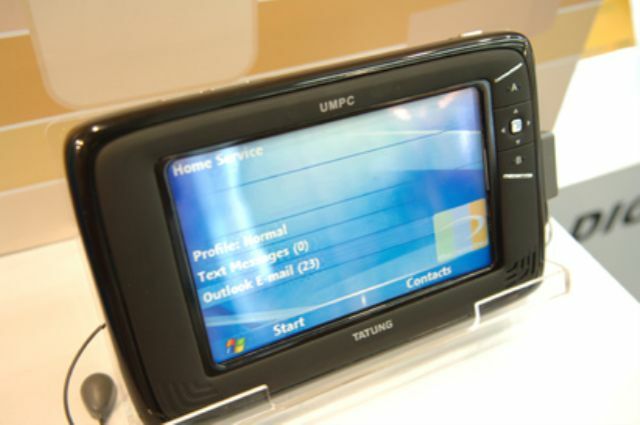 According to VIA Technology Director, the global market for next year is estimated in 130 millions of UMPC! Anybody looking for a ThinkPad x60? If you answered yes check this link. Please, read carefully, they said "many devices". This powerbank is a Universal Powerbank so you can charge or use it in any of your devices that require a voltage between 9 to 19 volts. But... what battery life should you expect to see in your eo V7110? A little more than 4 hours. Just do the math, if the original battery with the 24 Wh gives you around 2 hours, this bank with 56 Wh will give you 4 and 40 minutes. Of course, you should add this 4 hours to those 2 hours that gives you your eo's original battery, so that's a total of 6 hours and 40 minutes running on battery. 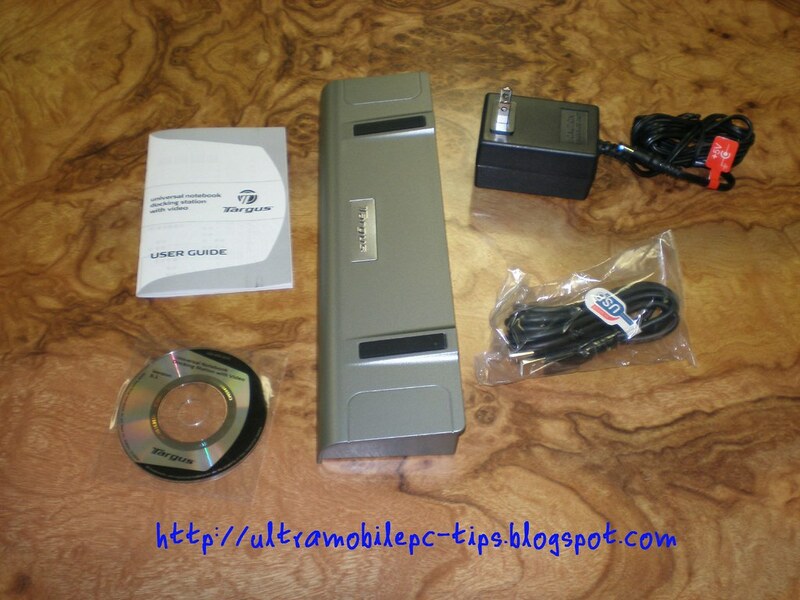 To get 8 hours using this battery bank in your eo v7110 you have to turn off the screen almost the whole time. One Tip, use the bank when you have your battery in your eo fully charged. In that way the power bank does not use an extra power to charge your battery. Once the Power Bank is gone, then unplug it and use the eo's battery. TORRANCE, CA, December 18, 2006 — TabletKiosk™, a leader in Tablet PC and mobile computing solutions, is pleased to introduce the Powerbank MP3400 Universal Battery Pack, the simple and efficient way to add hours of computing time to your Sahara Slate PC®, eo™ UMPC or other portable computing device. The Powerbank MP3400 is a rechargeable battery pack that can power many portable electronic devices. To use, simply connect the MP3400 to your mobile device and select the appropriate output voltage. Properly configured, the Powerbank MP3400 can extend the normal battery life of many devices up to 8 hours, and as an added bonus, can also simultaneously charge a device’s internal battery provided it requires less than 65W (output 19V/3.5A) of power. The MP3400 ships with eight (8) different adapter tips to fit the DC ports on many common electronic devices, including portable DVD players, digital cameras, digital camcorders, PDAs, mobile phones, and more. The Powerbank MP3400 is available now for $159 at www.tabletkiosk.com. 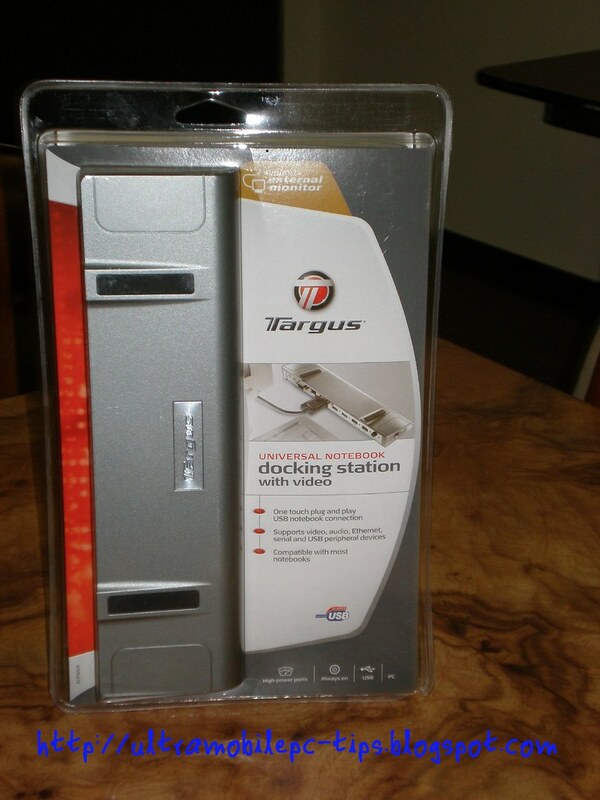 While eo v7110 owners still waiting for the Docking Port for this device they may want to check the Targus ACP50US Universal Docking Station. Always Connected: A dream or a Reality. Please, do not tell me that Sprint, Verizon or any other Cell Phone company is better. They all work the same. They even share the same towers and the same network (some of them). I have checked with my friends using other companies and in South Florida Beaches the signal is poor no matter what company are you using. TrueTip , a companion for Dialkeys? Today I posted about how Jeff was trying to find out a way to hold his v7110 and type using Dialkeys. Well, I think that I found the solution for Jeff here. Would you use one of these? The Compact Flash slot is one of the best features that the Samsung Q1 has. Yes, the CF cards are old and big but I prefer to have this slot than a SD Card one. And I will explain in this article why. Being one of the oldest memory card format in the market it had the time to mature and now we have, beside all sizes and types of Memory CF Cards, a lot of different accessories that use the CF slot to connect to our Pocket PCs, PDAs, and now Q1s. Being an old technology sometimes is not bad at all, the price for these accessories is sometimes 10 times less than when they came out to the market few years ago. Memory Card Readers and Adapters. The Samsung Q1 could become the best companion for a professional photographer. 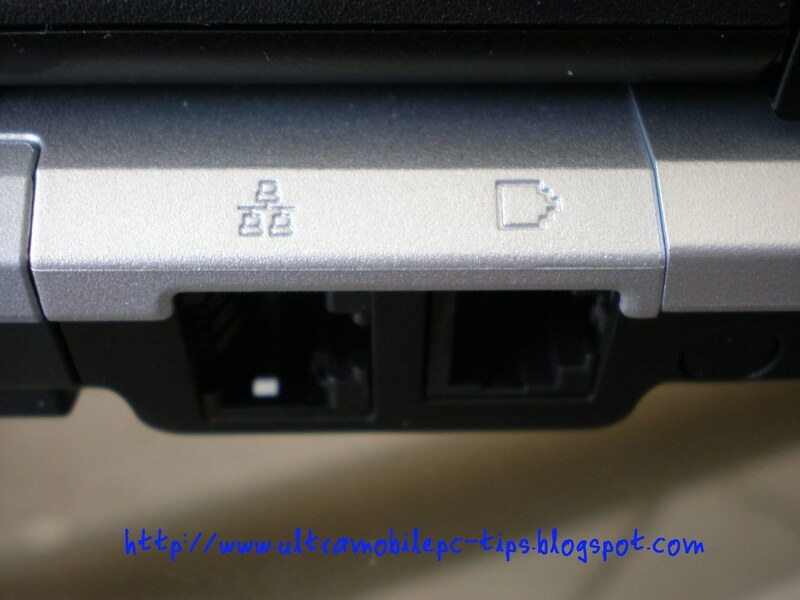 Yes, I know that most of the Digital Cameras in the market can be connected to this UMPC via a USB Port but in my experience that's not a comfortable thing to do when you are on the road. Well, here are a few adapters and card readers that will allow you to connect almost any Memory Card to your Q1. 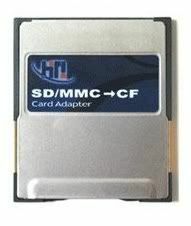 This adapter allows you to connect to your CF Slot 17 different type of memory cards: SD, miniSD, MMC Plus, MMC, MMC Mobile, RSMMC, TranFlash (needs an adapter), MS, MS Magic Gate, MS Select, MS Duo, MS Duo MagicGate, MS PRO, MS PRO MagicGate, MS PRO DUO, MS PRO DUO MagicGate and xD. 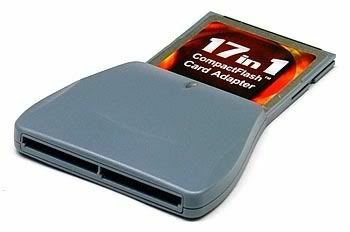 If you need just a more specific adapter you can find some like the Hi-Touch Secure Digital to Compact Flash Card Adapter. This one is just for SD and MMC Cards and the advantage of this kind of adapter is that it does not keep part of it out of the CF slot like the first one I mentioned. 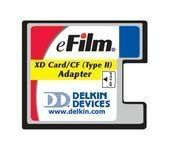 If you use xD Memory Cards then you can buy the Delkin Devices XD TO COMPACT FLASH ADAPTER (DDXDFLS-AD). Now you can see why I said that the Samsung Q1 could be the best companion that any Professional Photographer ever had. You can use in this device virtually any memory card without having to deal with USB Cables attached between two expensive devices while you are on the road. 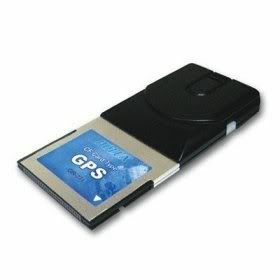 You can find some GPS devices using CF Format. I'll mention just two of them that I found with drivers for PC. The price of these two is between 60 and 80 dollars. In both cases you can connect an Antenna, something that you may need when you are using these GPS in your car. Believe it or not there are moments when probably you are going to need a modem to get access to Internet. 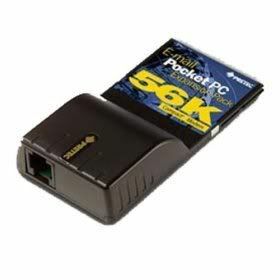 In this case you can use the Pretec 56k Compact Flash Modem. 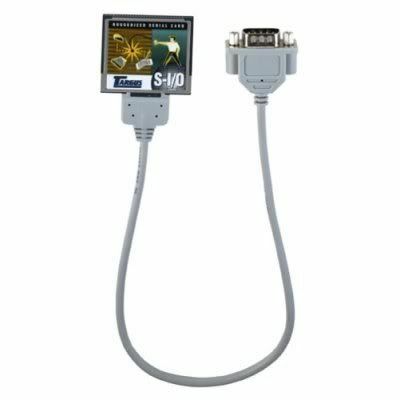 If you work in a IT Department you may need a Serial Connection to configure some devices. If this is the case then you can use something like the Targus PA611U CF To Serial I/O Card. What about keeping a Inventory Control Database? In this task you are going to need a Scanner like the Pretec CF LASER Barcode Scanner for PDA/ Pocket PC & portable devices w/ CF slot. I left this accessory for the end of this article because probably it will need some tweaking to make it work in a Samsung Q1: Pretec VGA CF Camera for PDA/ Pocket PC & portable devices w/ CF slot. 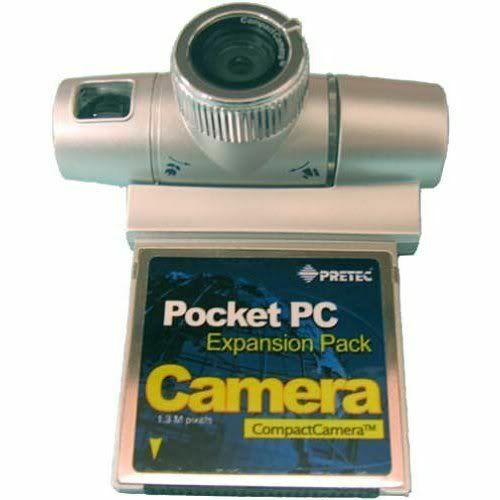 I could not find any information about this being used in a PC of any kind but I do remember when this camera was released a long time ago that Pretec released libraries to create programs compatible with this camera and I think to recall that somebody prepared a tool for PCs. 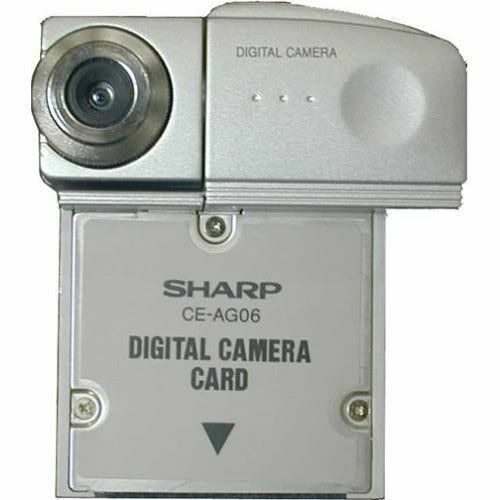 Sharp also released it a CF camera: Sharp Zaurus CE-AG06 Digital Camera Card. I could not find any evidence of the Sharp being used in a PC. In both camera the lens can be moved 180 degree allowing you to use it as a digital camera or as a web camera. Both are 1.3 mega pixel cameras so do not expect to take good quality pictures with these in the case that they can be used in a Q1. 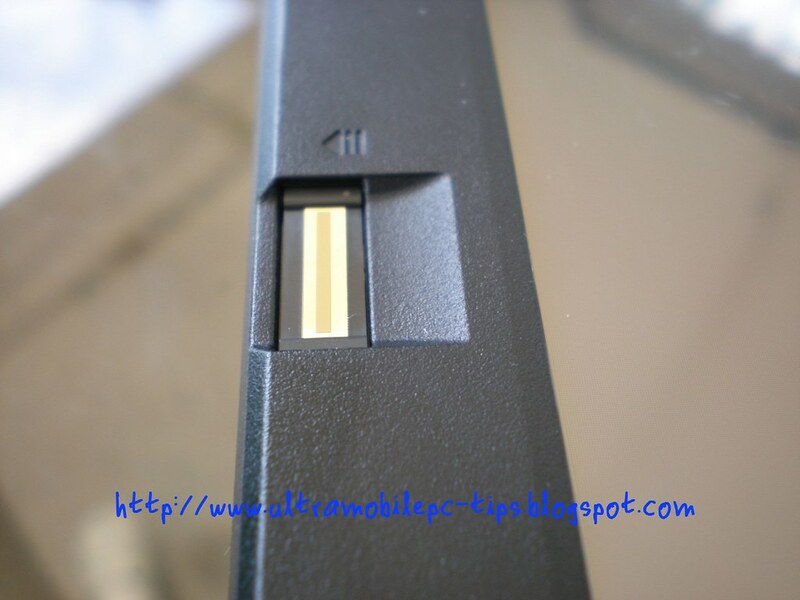 I hope that this article has helped you to have a whole idea of how many things you can use in your Samsung Q1 Compact Flash slot. As you can see even when CFs are old and slow, to have a CF slot could be a lot better than to have a SD slot where you can connect a lot less accessories. Note: Some of the links used in this article are affiliated links. Using them you are helping the author of this article to help others with more articles like this one. are you using Dialkeys in your eo v7110? While writing in my eo v7110 is a lot better experience than writing in my Q1, typing in my eo using Dialkeys is just impossible. The screen is just not sensitive enough for this kind of program. But... our reader Jeff (from France) has sent me a picture of a technique that he is using that according to what he said is the best way to use Dialkeys in an eo v7110. Holding his eo in this special way he has been able to use Dialkeys! Jeff, would not be easier to use the TIP and Ink? Anyway... I´ll keep it in mind the next time I test Dialkeys. Gottabemobile has just uploaded a video interview with Ed Holloway. Ed Holloway is quite active on a number of fronts when it comes to developing ink applications. As the co-founder and CTO for Field2Base he is instrumental in the development of that forms application as well as the new Forms2Base application that was recently released. Ed Holloway's Blog is in my list of RSS feeds that I check daily. 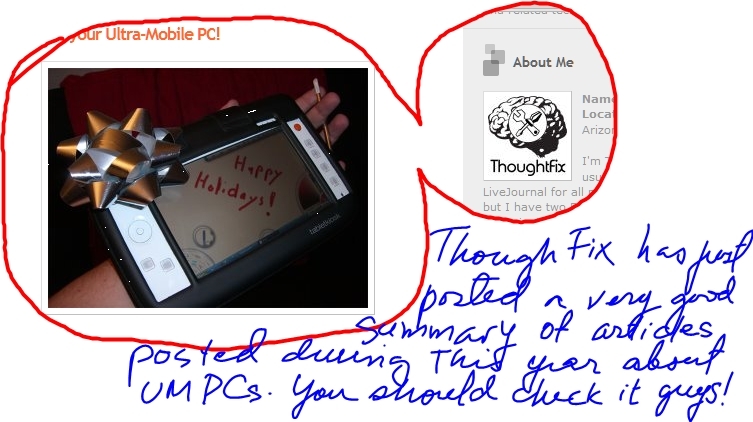 He's Ink Blog Plug-in for Windows Live Writer is one of the best applications that can be used to "blog" in ink. He's Beta for the Ink Search Tool was my inspiration to create Inkoogle, a tool that I created because I needed something like Ink Search Tool but with more Search Engines on it. Sometimes Warner at Gottabemobile calls me prolific but I'm nothing compare to Ed Holloway. 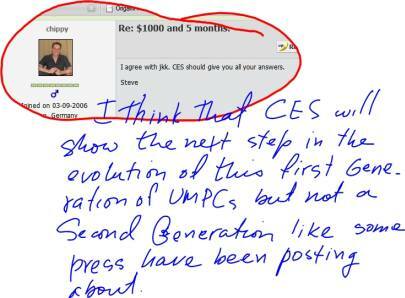 Thank to developers like Ed Holloway is that the Tablet PC market still exist. While I'm still waiting for a Vega that was supposed to be in my hands probably a month ago ;) I found in my RSS reader this review at Pocketables. This review is one of the most detailed that I have read about the Vega. And the author is right in many of the things he said. The external design does not bother to me too much. Sony old U serie had a worse design for me. Inkoogle is a Universal Web Searching tool that supports Ink. It helps Tablet PC and UMPC Owners to search in all Google different types of search engines, including books, froogle, images, maps, video, etc. But that's not all, you can search also in Wikipedia using the different languages available at this site, you use the Amazon Search Engine and you can use Pricegraber.com Search Engine for the different countries (languages) available on this site. This is why I call it Universal Web Searching Tool. 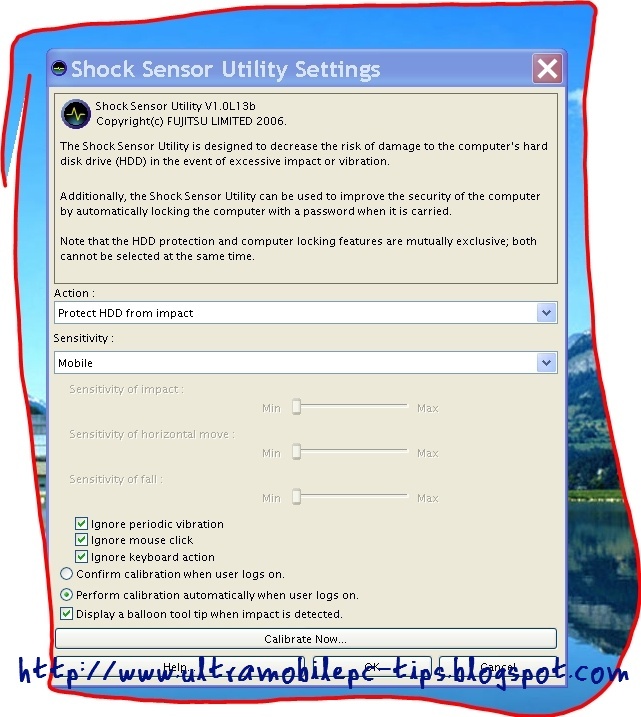 This tool is a freeware. You don't pay nothing for it. But it includes my affiliated ID in some of these searches. This does not cost you anything also and it does not interfere in any way with your searches. It just help me to pay my bills so I can continue helping you and others with what I do in this and other sites. You can download Inkoogle here. And you can download the .NET Framework v2.0 in case you need it here. UltramobileGeek just received a Bump Case for the eo v7110 and posted a few pictures of it. The good news is that this bump case works well with TabletKiosk's 6 cells extended battery. I have been working fixing a few things in Inkoogle and adding others. I'll release the final version tonight. What's new? I have added Amazon Search Engine and PriceGraber.com Search Engine to this tool. So users will be able to search at Google, Amazon, WiKi and PriceGraber. This are the kind of news that I like to read. Browsing todoUMPC's forum I found about this person in the above picture. This person got a Master Degree in History using the Asus R2H to Webcast her Master Degree Defense. She was webcasting to two different European Universities at the same time! The laptop on the table was a backup just in case the Asus failed, but they did not need, the Asus R2H worked perfectly. 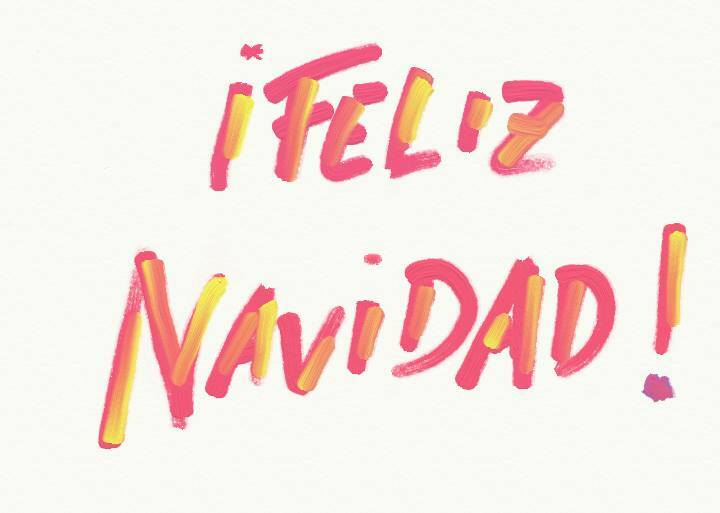 todoUMPC is an online community in Spain all about UMPCs. This page is sponsored by FarAndSoft, a company that makes OrdersCE - a marketing control software for Pocket PCs. They have started this new adventure with a healthy forum and a small online store with the best UMPC prices in Europe! 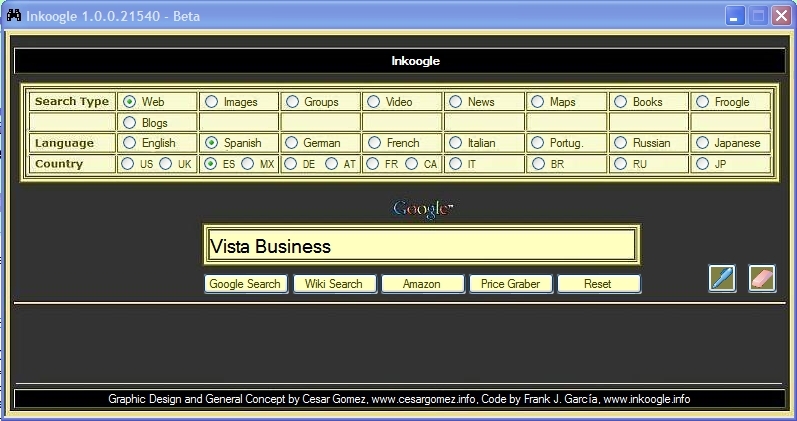 Inkoogle is a Universal Web Searching tool with Ink Support. 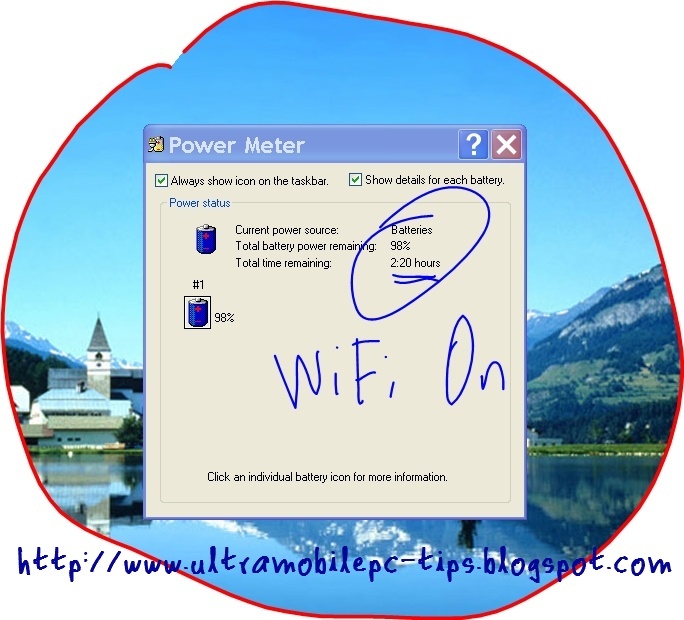 It helps Tablet PC and UMPC Owners to search in all Google different types of searches and in Wikipedia. The program was created using the latest Inkanalyze API from Microsoft that is a lot better than the old API. I have released the program as a freeware that can be downloaded here, but do not forget that this tool requires .NET Framework v 2.0 unless you are using Vista where it's already pre installed. BTW, I tested it in Vista and it works perfectly. I think that Warner is the first Tablet PC user that reports to have Aero running in his Lenovo ThinkPad X60. 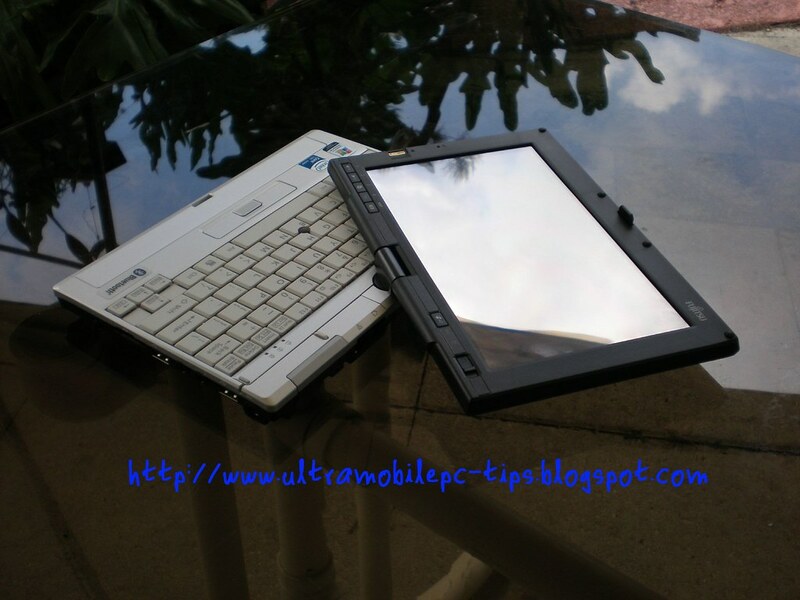 And if you have any doubt about how well Vista with Aero performs in this tablet take a look of this video. Steve has posted a Video that you all should see about the fabric keyboard. I'm currently working in an article about small keyboards that could be used as a companion for UMPCs. As many of you know, I'm a ink defender and I do not use keyboards with my UMPCs unless I need to type really fast or I need to restore the OS in one of them. 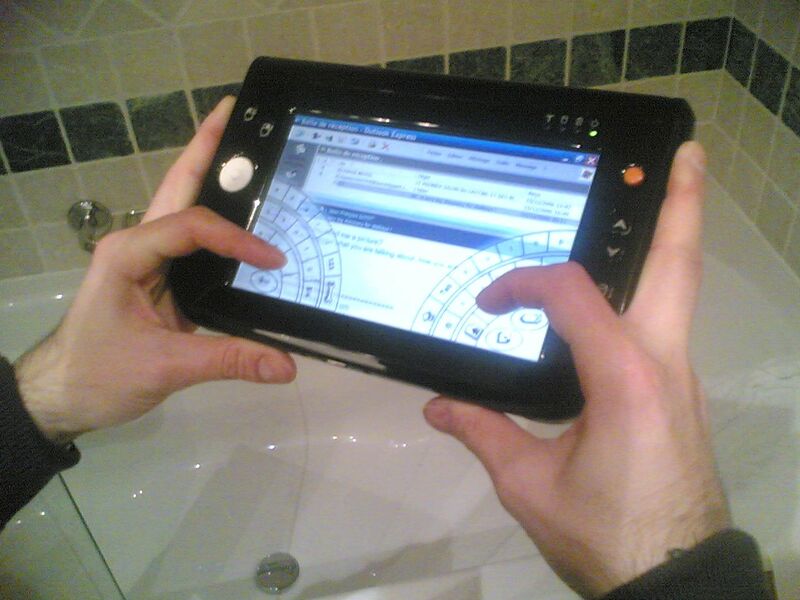 As you can see there are moments when a UMPC or a Tablet PC needs a keyboard. This is an inevitable fact that I yesterday discovered is ignored for some online stores that think that UMPCs do not need external keyboards. I really do not like the idea of UMPCs with integrated keyboards, they are just useless but I do think that every UMPC owner needs a external keyboard of any kind. If you are a UMPC owner, I'm sure that you know what I'm talking about. And if you did not received a USB or BT keyboard with your UMPC probably you are in the market looking for one. 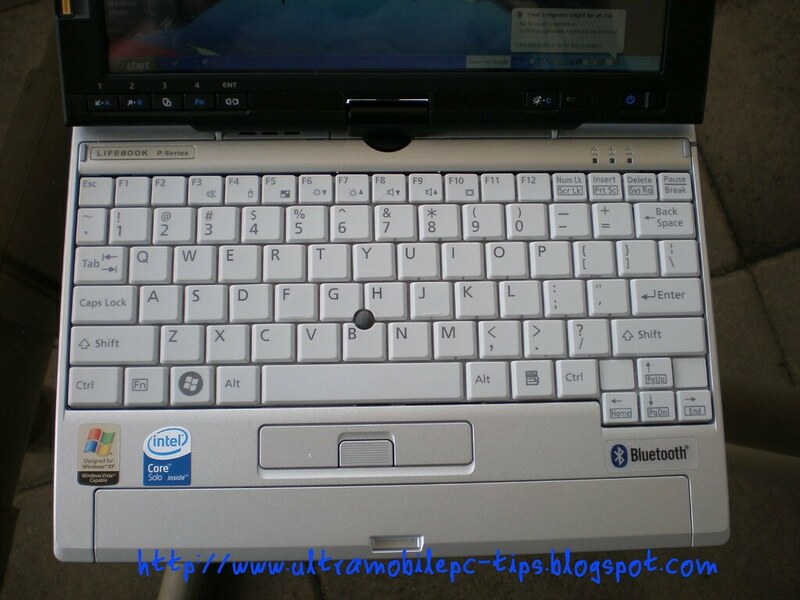 And for sure you have been asking yourself what is the best companion keyboard for your UMPC. 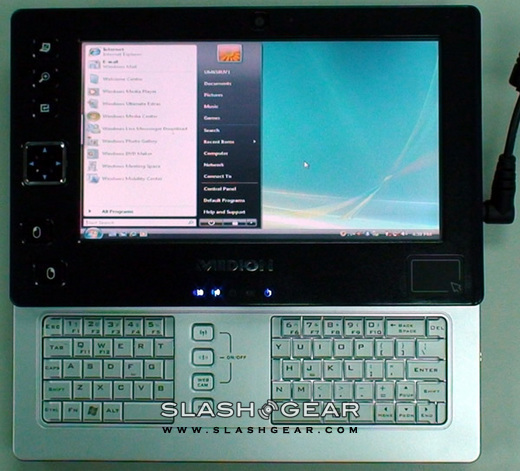 That's the question that I'm trying to answer, what is the best external keyboard for a UMPC? If you are a keyboard maker or a reseller and you want to sponsor this article, please contact me at ctitanic at tweaks2k2.com for more information. For those who speak spanish and want to read my review about the P1610, I just tranlated it and published it at todoUMPC. You can write with your hand touching the screen (See Picture). The P1610 screen is not too sensitive like Samsung Q1 screen. 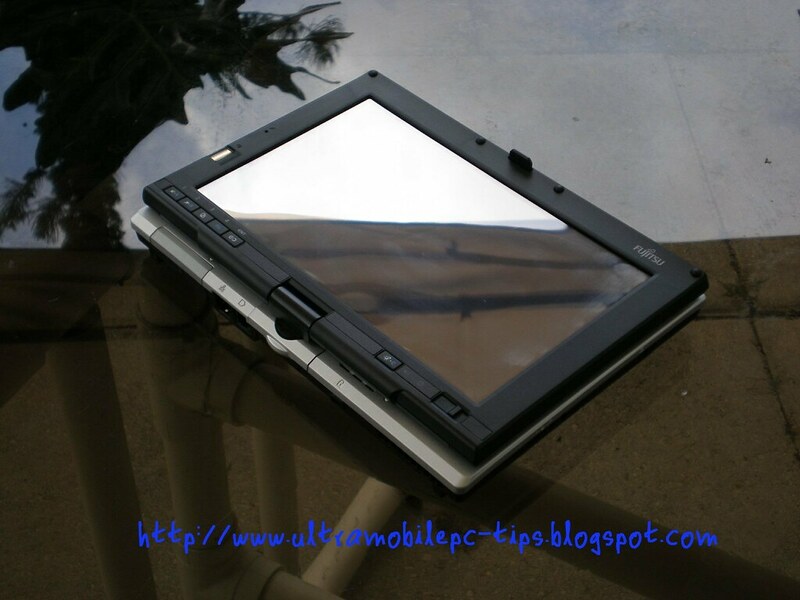 It reminds me the TabletKiosk eo v7110 screen. I also was surprised to see how bright this screen was. It's the best screen I have seen in a long time. Later I took the P1610 outside and turn it on close to my Samsung Q1 to establish a comparison. 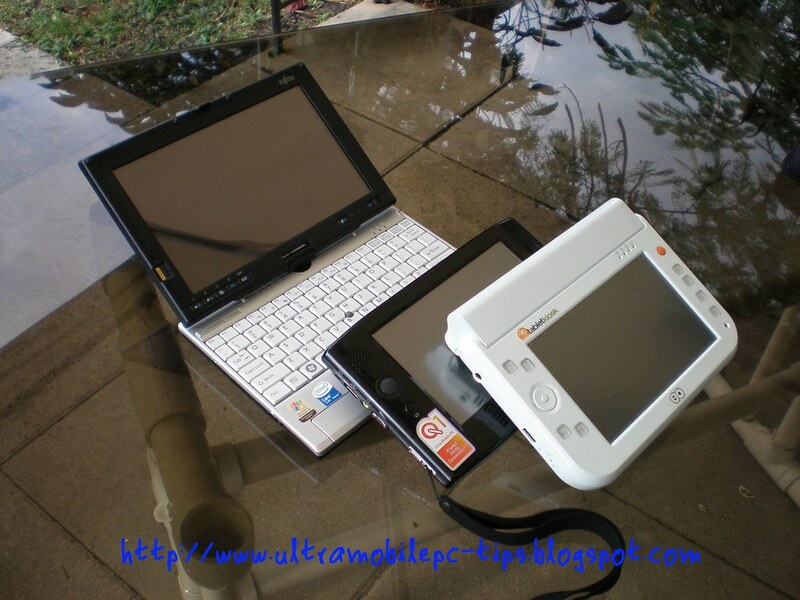 As you can see from the following picture the P1610 screen is a lot better than Q1 screen when they are outside. The CPU fan was very noisy and the P1610 was hotter than Samsung's Q1. It's cooler than TabletKiosk eo v7110 but hotter than Q1. The P1610 HDD is protected against vibrations by a program created by Fujitsu. I played a DVD Movie using VLC Player and the performance was good, no skipped frames. 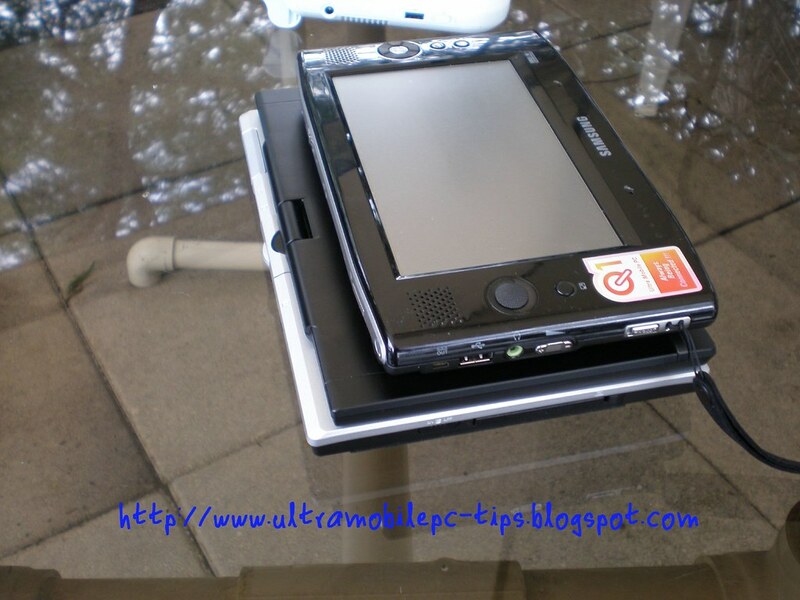 When you rotate the screen to use the P1610 as a Tablet PC the screen is rotated automatically to Portrait. Dialkeys came in this unit as an optional tool but to me is unusable. It just does not work well with the sensitivity of this screen. I likethe fact that Fujitsu did not install any trial version of programs such as antivirus and other kind of tools that you have to end buying after the trial period is over or uninstalling them. This unit have installed only what is really needed. OneNote 2003 came installed, and Evernote Plus came as an optional tool to be installed. The sound on this device was clear but the Q1 from Samsung has a better sound. Of course I wont let pass the opportunity of testing this unit to see how well it performs. I ran some benchmarks on it and here are the results. The first one was a BenchMark tool called HDBench. 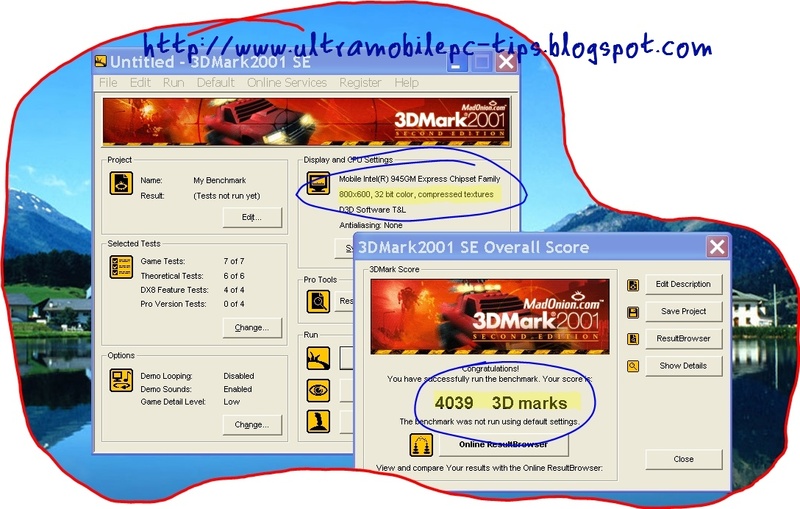 All UMPCs that I have tested with this tool and other that I have asked to test score around the 20000 while the P1610 scored 25553. 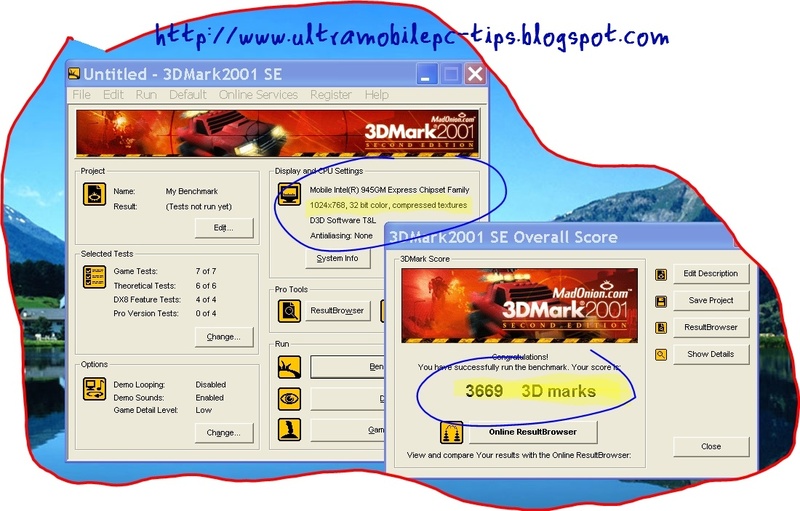 The second test I ran was the 3DMark2001 Benchmark. The P1610 performed very well in this test. To give you an idea, the Q1 scored 2979 at 800x480x32 while the P1610 scored 3669 at 1024x760. A really amazing score. How big is the Fujitsu P1610? 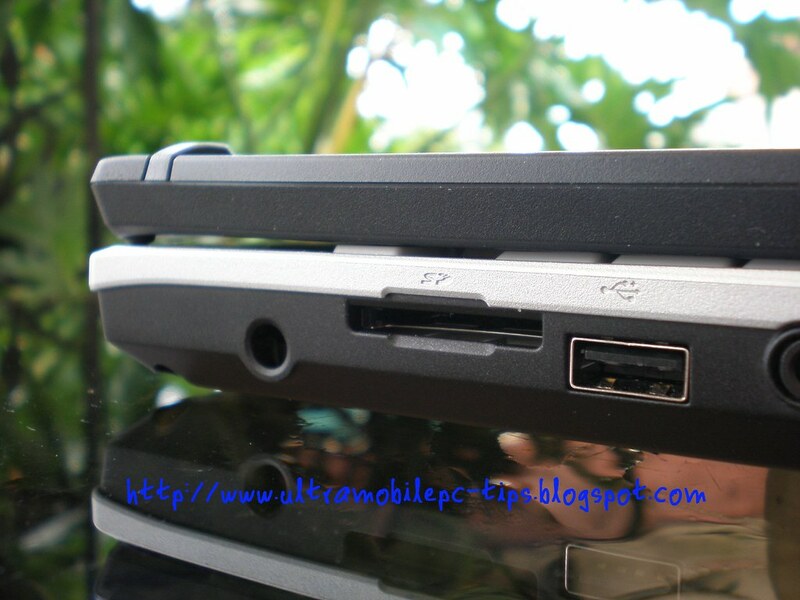 The P1610 is really small and it's weight is about the same than the TabletKiosk eo v7110. But I think that a picture worth more than a 1000 words so I took some picture of the P1610 close to Samsung's Q1 and TabletKiosk's eo v7110. 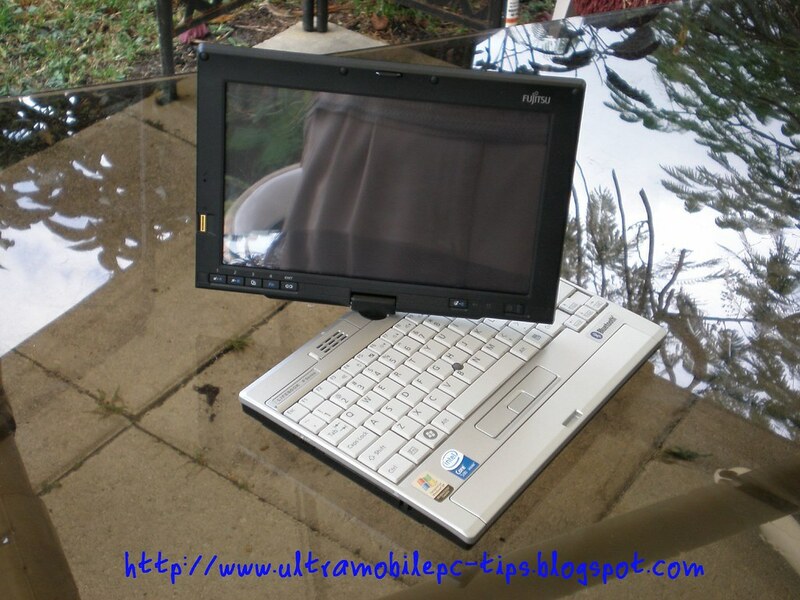 As you can see from the above pictures this Small Factor PC could be considered an Ultramobile PC. It's the same side of the eo v7110 using the Mugen Power 9 cells extended battery. I did not have enough time to run many battery tests but I did use the P1610 for some time connected to my WiFi router browsing the web. The battery life on this task was of 2 hours and around 15 minutes. 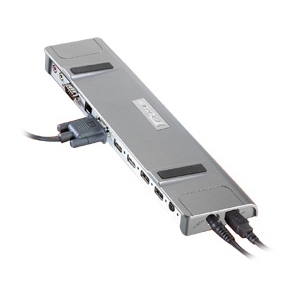 The Fujitsu P1610 includes a integrated mic with noise reduction. It includes a finger print reader as a security option. 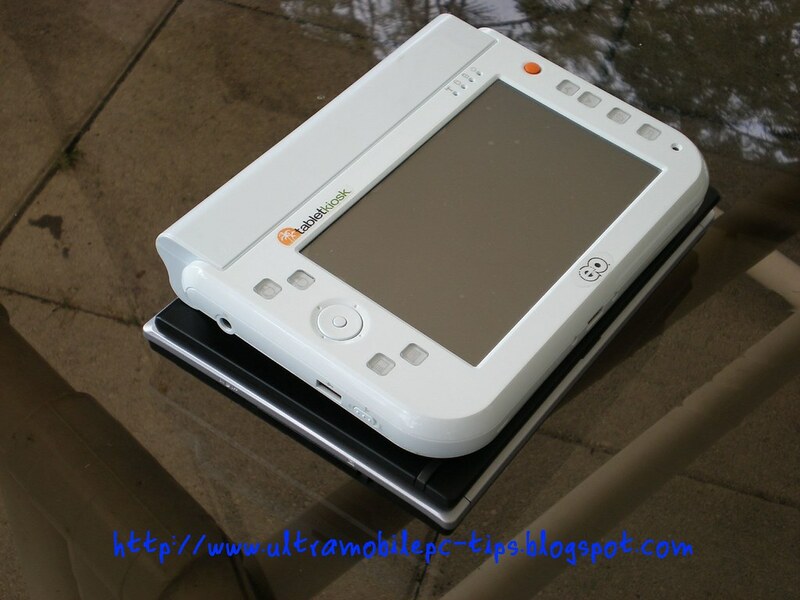 And it includes a PCMCIA Slot and a SD Card Reader. It also includes a internal modem and a Ethernet Card. 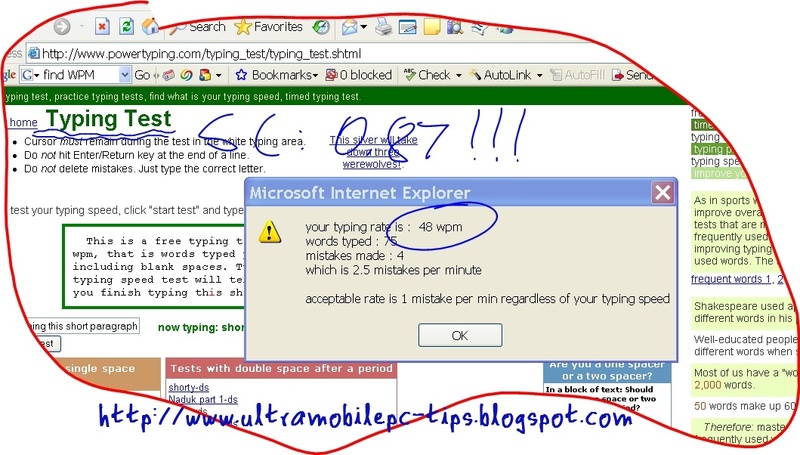 the speed you get in a normal side keyboard). What else would you want to see in a device of this side? The Fujitsu P1610 is just a Swiss Knife. None of the current UMPC in the market can come close to what this device offers. But at the same time you have to be prepare to pay around 2300 dollars if you want the P1610 loaded with 1 GB of RAM, a 60 GB HDD and Tablet PC Edition. One thousand dollars more than what you usually pay for the best loaded UMPC. If you are a professional photographer sending pictures to your news paper you wont find a better companion than this one. It's small but it's powerful at the same time. If you are in a field where you need a powerful Small Factor PC all the time with you, with a Inside/Outside display, the Fujitsu P1610 is what you are looking for. But if you are looking for a companion PC probably you will save 1000 dollars getting a UMPC. But keep in mind, it wont be that powerful. What is my score for this device? 9 out of 10. I would give it a 10 if it was cheaper. It's true that you can get it for 1649 dollars but it will be lacking of HDD space, RAM and you wont be able to use all the features included in XP Tablet PC Edition (keep in mind that this device is Vista Capable and Vista includes by default these features). 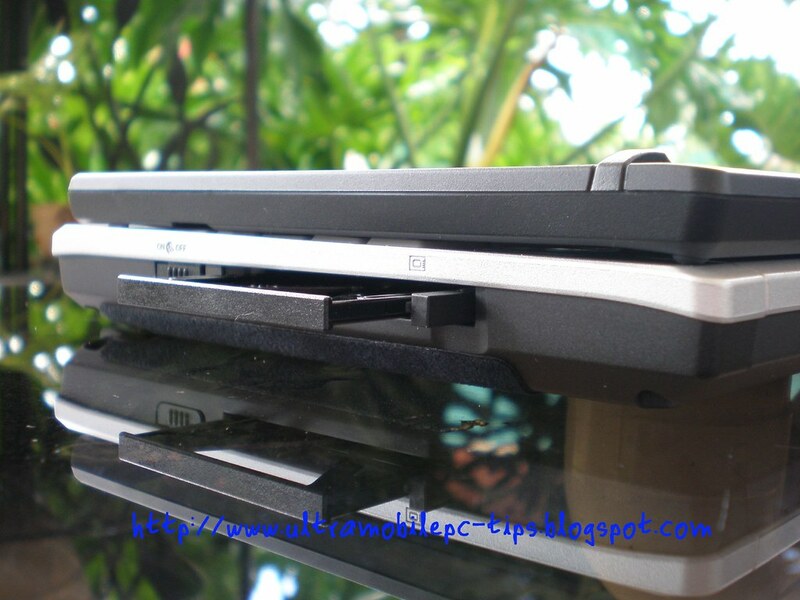 You can customize your Fujitsu P1610 at alltp.com and I want to thank this company for sending me this unit for this review. You can check the rest of the 52 pictures and screen shots that I took for this review here.